Meet Life Size Animated Undead Fred, he won't bite…or will he? Yes, he wants BRAINS! This disturbing decomposed hanging severed zombie human skull head has scary realistic decomposing sculptural detail. His decapitated body part is made of rigid PVC plastic with synthetic hair. 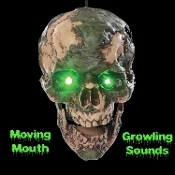 Noise activates the light-up eyes and moving mouth with creepy hungry zombie growling sounds. Requires 3AA batteries (Demo included) and has a Try Me function. Severed Undead Fred Animated Prop can be set for sound activation or steady-on for continuous operation. Recommended for indoor or covered porch use only. 7-inch high x 6.5-inch wide x 9-inch deep (17.5x16.25x22.5cm).